This Easy Baked Blackened Salmon recipe is tender and juicy. 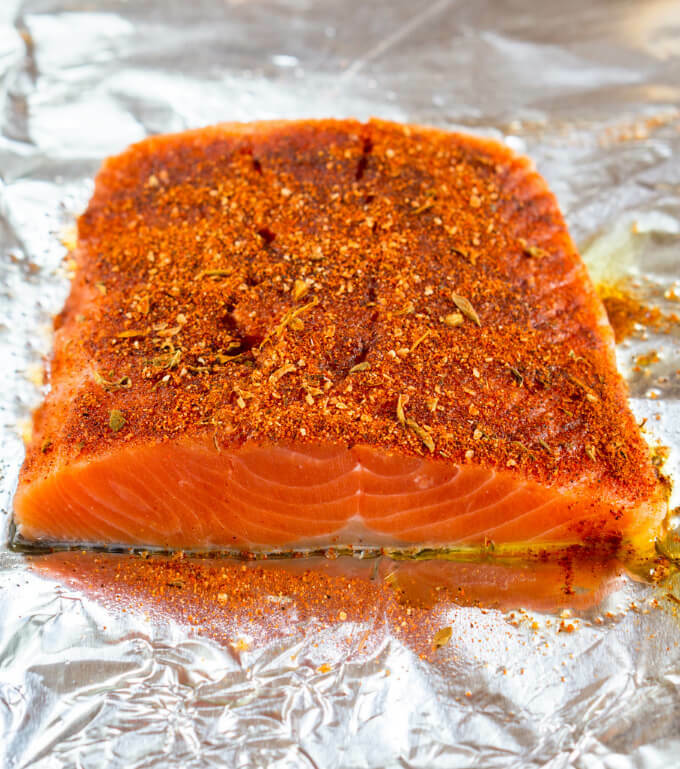 It has the perfect contrast between the spicy Blackened seasoning and the sweet salmon. A Browned Butter lemon drizzle ties everything together giving it a bright finish. I grew up eating comfort foods and didn’t understand what healthy eating was. I ate when I was tired, stressed or bored. My idea of taking off a few pounds usually included starving myself and as a result was either too heavy or thin for most of my life. I understand what is meant to lose the same 10 pounds over and over and over. I’ve since added Baked Blackened Salmon in my fight against my weight. As an adult, I’ve tried many programs and lost weight with success…for a while. In 2013 I found a program that gave me just a few rules. I could eat whatever I wanted but once I hit my daily calorie allowance I was done for the day. Another requirement was that I had to exercise 30 minutes every day. By counting calories, I learned to make better choices like dinner recipes with salmon. Exercising regularly made me feel better about myself. I ended up losing 45 pounds. It was life-changing. Feeling this good motivates me to cut back when the weight starts creeping back. It’s easier to tackle 5 pounds than it is 25. There is no silver bullet for weight loss. I just take it day by day and sometimes minute by minute. I don’t share this picture very often but was thinking why not. There’s no shame in being overweight. Thinking like that makes me want a pound of chocolate! Share and be proud of the hard work you did to get it off. Right? Back to the Blackened Salmon Recipe! I don’t starve myself anymore. 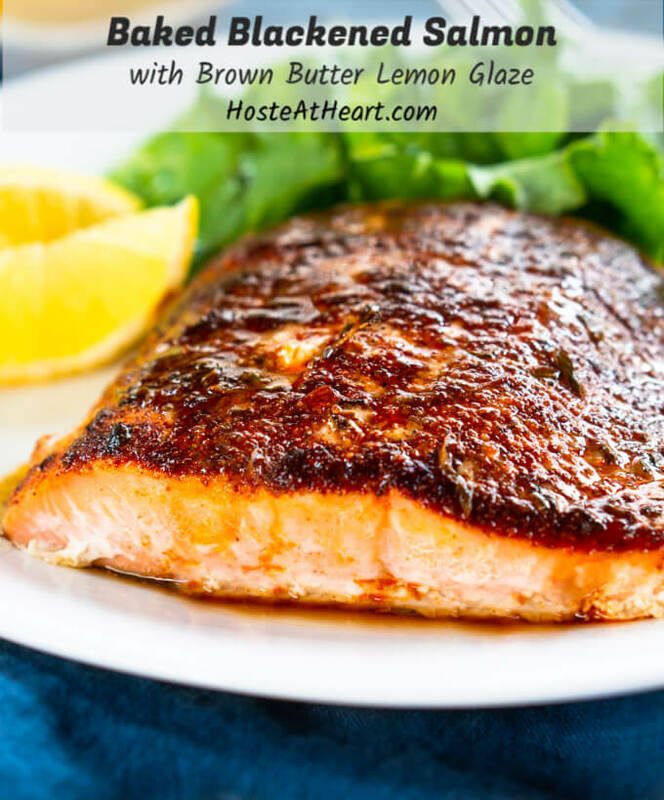 Instead, our meals include easy baked salmon recipes like this one or our Sensational Baked Blackened Shrimp which is perfect as an appetizer, dinner or on a salad. I seasoned both of them with this Homemade Blackened Seasoning Blend. What are the different types of salmon? There are 5 types of wild-caught salmon available to the United States. They are all Pacific salmon and sometimes these salmon types go by different names. Chinook salmon can also be called King salmon and have a higher fat content. Chinook salmon is one of the best tasting Their color ranges from white to deep red. Coho salmon can also be called Silver salmon because of their silver skin. The Coho color is a bright red and has a more delicate texture. Their flavor is similar to Chinook salmon. Pink salmon are most commonly canned but can also be eaten fresh. Pink Salmon have a light color and flavor and a low-fat content. This fish can be called humpback or humpies after the hump they develop on their back when the spawn. Chum salmon also goes by Dog salmon, Keta salmon or Silverbrite Salmon. This fish averages about 8 pounds and has a pale or medium colored flesh and lower fat content than other salmon. Let’s keep in touch! Stop on over and say hello. I always love hearing from you. Wild-caught salmon is said to be healthier for us to eat. Wild-caught calorie and fat content are lower than farm-raised because of their natural diet and they contain fewer contaminants. Capturing wild-caught salmon is regulated by safe fishing practices. Many farm-raised salmon are fed color-enhancing food and given antibiotics. These measures increase their calorie and fat content. Farmed salmon has had issues regarding sustainability practices. While practices have improved, it’s best to look into the source if this is important to you. How do I make a Baked Salmon Fillet recipe? Fillets should be the same size so they bake evenly. Drizzle fish lightly with olive oil. Drizzle with brown butter lemon mixture. Use a pan with a light covered bottom so you can see the color. Start melting the butter over medium heat. Swirl the pan. The butter will foam but that will reduce as it cooks. 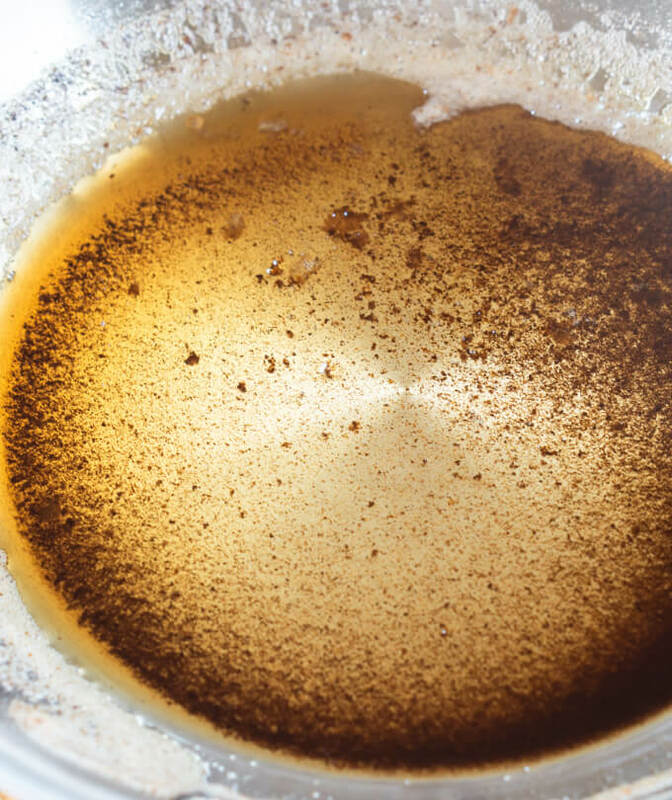 Once the butter is a rich brown and milk-solids settle in the bottom. Spoon or strain the butter into a separate container. Some people include the milk solids but I just use the golden butter. Allow the butter to cool slightly before you add lemon. 10-inch Fry Pan – I use this skillet all the time. It’s sturdy and cleans up like a dream. Baking Sheet – These sheet pans are durable and I have four of them so I can get all of my cookies baked in a jiffy! Here are a few more that I think you’ll love! If salmon isn’t your thing, you can make any blackened fish recipe. This seasoning is great on chicken too! This Easy Baked Blackened Salmon recipe is tender and juicy. 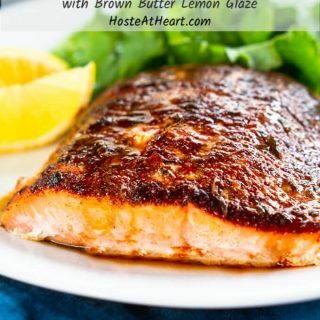 It’s a heart-healthy dish that has the perfect contrast between the spicy Blackened seasoning and the sweet salmon. A Browned Butter lemon drizzle ties everything together giving it a bright finish. Preheat the oven to 375°F. Line a rimmed baking sheet with foil and drizzle lightly with olive oil or spray with a non-stick cooking spray. Place the salmon on the rimmed baking sheet skin-side down. Tap the fish dry with a paper towel. Drizzle lightly with olive oil and season with blackening blend. Bake 12 to 15 minutes or until an instant-read thermometer measure 120°F and fish is flaky. I removed the foil from the pan with the fish on it immediately to stop any further cooking. Squeeze 1/2 a lemon into the browned butter. Some people use milk solids. It’s up to you. If you put lemon in the butter when it’s hot it will pop and sizzle. You are beautiful inside and and out, my friend, and you make a mean salmon! This was delicious! Thank you, Michaela! You’re the best! You had me at the Brown Butter Lemon Drizzle! What a fantastic recipe! Congratulations on your weight loss. You look fantastic and yes, you should be super proud of yourself. I can’t wait to make your blackened seasoning to lather on a nice piece of salmon. I’m sticking with wild caught salmon! Thank you Sandra! I really like the wild caught pacific varieties too! This salmon is just amazing and I’ve been really looking for super flavorful but healthy recipes that I can enjoy while trying to improve my overall health and wellness as well. That can be a struggle but this one is easy, yummy and healthier! Thank you, Amy! You had me at brown butter. Seriously, that is such an amazing flavor for salmon, my family would love it! I don’t know anything that isn’t improved by brown butter! Thanks Jennifer. Go to agree with that! The spices on this are spot on! They sound right up my families tastes and Im so excited to make it for a dinner party we’re having next weekend! This looks wonderful. Salmon is so good for you and so tasty. I love the idea of using blackening spices too. Thank you, Debi! I’m kind of picky with fish and can get grossed out easily so salmon always works for my fish choice! Julie, you have outdone yourself both with the recipe and the write up! Lovely! Thank you so much Mollie! That is so sweet of you. I thought the photo was an ad on your blog! How wonderful. I feel like I’m carrying around an extra person these days. My problem is portion control. I already eat healthy food. Like this salmon. I’d have a hard time eating one little portion! It looks so good. I love browned butter anything! Thank you Mimi! I would too if I was eating some of that amazing food you make! There are some of those dishes that I have trouble resisting and my weekend wine doesn’t help either. We’re healthy though right? 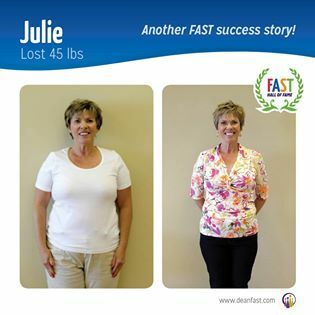 Aww great share Julie – so impressive and inspirational. I know we’ve talked about this before, what a great accomplishment, I’m sure you’re well chuffed with the results. You always look wonderful anyway 🙂 A wedding is definitely cause to shed some pounds, I tried, but failed. I’m finding it so tough to lose the 5 lbs that I put on since I’ve been suffering from my back issues, almost 2 years now. I feel it’s tougher to lose less than more, if you know what I mean. Still, I never give up and we exercise, walk and do yoga too. Love salmon, we cook it weekly, you’ve given a boatload of information which is great for first time cooks. I’ve got to check out your home made blackened spices, I recall vividly when you first posted it. Great job! I totally agree with that tough 5 Loretta! I thought you looked amazing for your daughter’s wedding. There is just so much that plays into it all you know? I do have that 5 I would like to lose but I’m just doing the best I can without getting all nuts. I dieted myself fat! I had my granddaughter today and that’s one of the toughest workouts I do! That girl is BUSY! I love our talks and really appreciate your support and stopping by. Thank you, Judi! I love hair day and you’ll have to let me know how you like the salmon. It’s a lot of work losing weight like that but is doable in bits and pieces. You always look great, Julie. It’s not easy, but you can do anything you set your mind to for sure! When I tell people I lost 40 pounds by counting calories and exercising as your doctor tells you they look at me with a blank stare. I think some people think there’s a magic diet or pill. Gimics never work… Anyway, I love this salmon recipe. I adore salmon of any kind! I know what you mean. I always say “their eyes glaze over”. I took my motivation to share my story from you. I always love what you share and you look like you’re rocking the new bod! My son gets married in March so I want to look nice. I followed this recipe with no variations and it was a huge hit with the family, my husband (who prefers beef to fish) finished with a compliment- “Blackened Salmon is my favorite!” :))) So I knew the recipe was a keeper with his review. Thanks for sharing! Thank you, Ethel, for letting me know and the 5 stars! I always love getting the hubby’s perspective too! Congrats Julie! This is really inspiring! And I’ve never successfully made salmon (isn’t that odd?) but I think I can rock this recipe – YUM! Thank you, Annie! Like you, I always had John grill it. I don’t catch it, clean it or cook it. That is until I started baking it. It comes out perfectly every time. I hope you’ll let me know if you try it! Yum. Great low carb dinner. We had it with a big salad. There is so much awesome info in this post, thank you! And, of course, this salmon looks divine! Thank you so much Wilhelmina!